We’ve been Colorado's #1 trusted choice for over 30 years. When you get the call that one of your loved ones, family members, or friends has been incarcerated, there are many thoughts that go through your head. This experience can leave you feeling overwhelmed and anxious. Our criminal justice system can be very confusing. What is the next step to take? How do you return your loved one home? Who can you call for help? A-1 Bail Bonds can help you answer all of those questions. Our family-owned and operated bail bonds business in Denver, CO has provided expert advice and financial assistance for people throughout Colorado for over 30 years. Our experienced team will help you understand everything about the bail process and inform you about your available choices. Call Colorado’s #1 bail bond company at 303-423-3000. Our staff at A-1 Bail Bonds takes every bond seriously, no matter the cost. 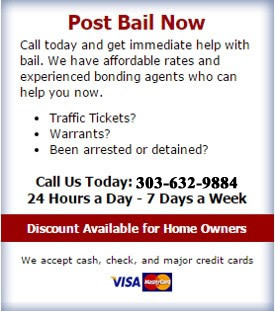 When you need our Denver bail bonding services, contact us any time of the day or night. Once we get the information we need from you, our full attention is directed into making sure your family member or friend is out of jail and back home as quickly as possible. Before you make any final decisions, we make sure to give you and your incarcerated family member comprehensive information about all the options available to you. This ensures you have all the facts to make the best choice for your situation and will fully understand the agreement you’re signing. Our knowledgeable staff is able to answer your questions about bonding services and posting bail including the responsibilities of the cosigner. Gather required information: Before you can do anything about paying the bond to release your loved one, you’ll have to gather some information about the circumstances of their arrest. You’ll need to have his or her full name, birth date, the charges, the bond amount, and the location of the jail he or she is being held at. Many county jails have inmate search sites where you can find some of this information. Call an experienced Denver bondsman: After you’ve gathered the required information, call the experts at A-1 Bail Bonds. We’ll provide you with expert guidance throughout the rest of the bonding process and ensure your family member or friend can return home in a timely manner. Make a decision: Once we know the bail amount, we can present you with the options for release. There are different types of bail. We’ll help you understand which options are available under your unique circumstances. We can work with incarcerated individuals on their own, as well as with friends and family to find an option and payment plan that works for everyone. We’ll take care of the rest: Once the decision has been made, we’ll take care of the rest of the bond out process. In order for the bond to be accepted, the defendant must be fully booked into the facility. Their fingerprints must also be cleared. This can take several hours, depending on the workload at the facility. You can usually expect a release within 4 to 6 hours. Ensure the defendant appears in court: Once your loved one has been bailed out, it is extremely important that he or she appears for all court proceedings. This is part of the agreement, and if you put down collateral, it will be at risk if the defendant fails to appear. When you use any bail bonding service, you are guaranteeing that the defendant will appear at all assigned court appearances. If the defendant fails to appear in court, the bond will be revoked, and a warrant will be issued for their arrest. This also puts your collateral at risk. We work with families on payment plans that fit within your budget, explaining all the details, so you understand how the repayment plan will work. If you are ready to ask for help in getting your loved one out of jail and back home where they belong, speak with our friendly representatives at 303-423-3000.